Kick back and relax at The Meadowbank Residence. 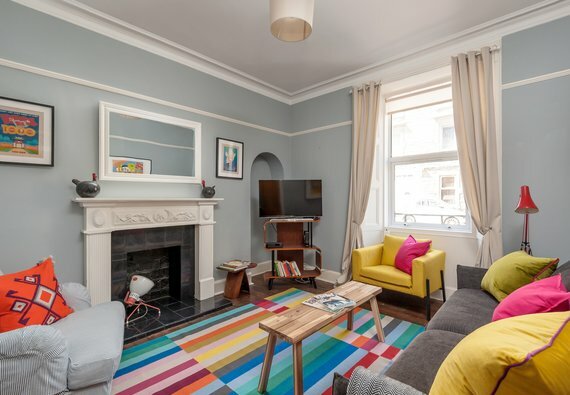 Located less than one mile from the Royal Mile and the Old Town, this delightful, two-bedroom property boasts modern interiors and main door access. The bright and airy living room is perfect for relaxing after a long day of exploration in the city. Comfy sofas, contemporary artwork, and a feature fireplace delight the senses, whilst a large, flat screen TV with Freeview, and unlimited WiFi cover all of your entertainment needs. The newly refurbished kitchen comes fully equipped with everything you need to cook up a storm, including oven with hob, microwave and Nespresso machine. Move through to one of the two bedrooms for a peaceful night’s rest. One bedroom has a double bed, and the other benefits from a zip’n’link bed so can be set up as either a superking or twin beds. Both bedrooms have plentiful guest storage, and quiet outlooks. A modern family shower room completes this charming home from home. Thanks to The Meadowbank Residence’s unique location guests can enjoy being right in the city centre, whilst being tucked away on a quiet street away from the noise, hustle and bustle. Holyrood Park and Arthur’s Seat are just a five-minute stroll from the property, and The Queen is practically your neighbour as HRH’s Scottish residence the Palace of Holyroodhouse is a 15-minute walk away. The Royal Mile and Old Town are under one mile away, and Edinburgh Castle is 1.5 miles. There is a large Sainsbury’s across the road at Meadowbank retail park for grocery shopping. This property operates a key safe, so you can let yourself in to the property any time after 4pm. The key safe code will be issued before your arrival. If you are arriving earlier than 16:00 on your day of arrival, it is always worth contacting the property manager as they will always endeavour to give you access as soon as possible. You may be able to arrive early and leave luggage and come back however this is not guaranteed. Sleeping arrangements 2 double bedrooms one has a zip and link bed which can be set up as 1 double or 2 singles. 1 double sofa bed in the lounge. * These extras can be selected when making your booking. Interior layout A central hallway leads to a living room, separate kitchen, family shower room, and two double bedrooms. No reviews yet for The Meadowbank Residence. Allow Reserve Apartments to contact you in the future regarding products and services which may interest you.